After years of work with Weta Workshop, the British High Commission has revealed the final design of the United Kingdom’s presence in Pukeahu National War Memorial Park. At almost five metres tall, the design takes the form of two of the United Kingdom and New Zealand’s most iconic trees. The trunks of a Royal Oak and a Pōhutakawa intertwine to form one single leafy canopy, where leaves from both trees merge to create sense of shelter - giving the memorial its name: Whakaruruhau. 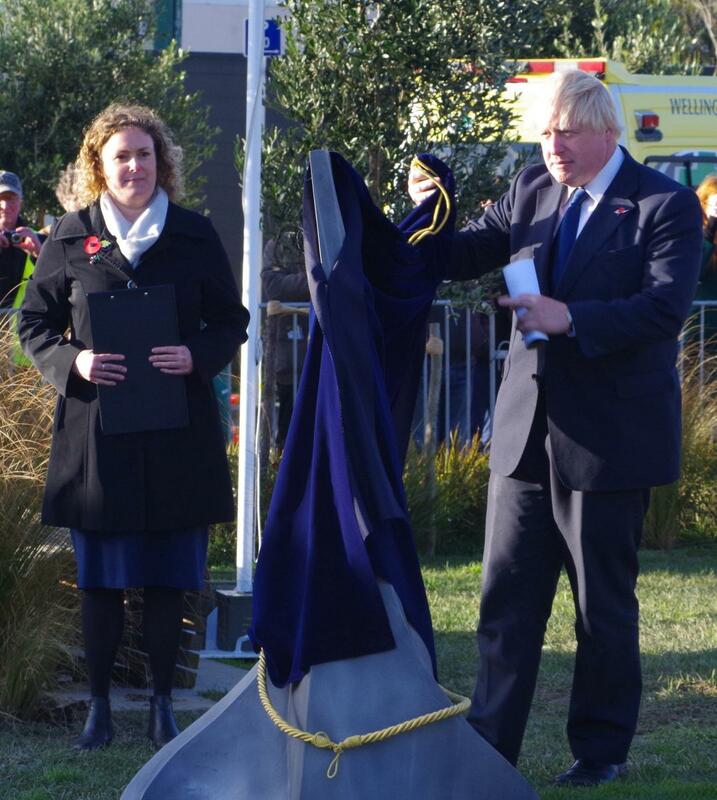 Gerry Brownlee and Boris Johnson laying wreaths at the 24th July 2017 unveiling ceremony. Standing at the plaque, between the branches a silhouette of a single soldier can be seen, representing the union of two countries who stood side by side and those millions who served in times of conflict, resolution and peace. Acting High Commissioner, Catherine Allum, expressed her delight at the opportunity to share the modern design. Catherine joined lead concept designer, Rebekah Tisch and manufacture supervisor, Andrew Durno from Weta Workshop at the British High Commission on Thursday to experience the memorial via a ground-breaking virtual reality experience. The trio were able to walk around the memorial as it will stand in a virtual version of Pukeahu National War Memorial Park. The virtual experience allowed different elements to be examined and explained. The UK Memorial at Pukeahu National War Memorial Park featuring the silhouette of a single soldier in the top branches. 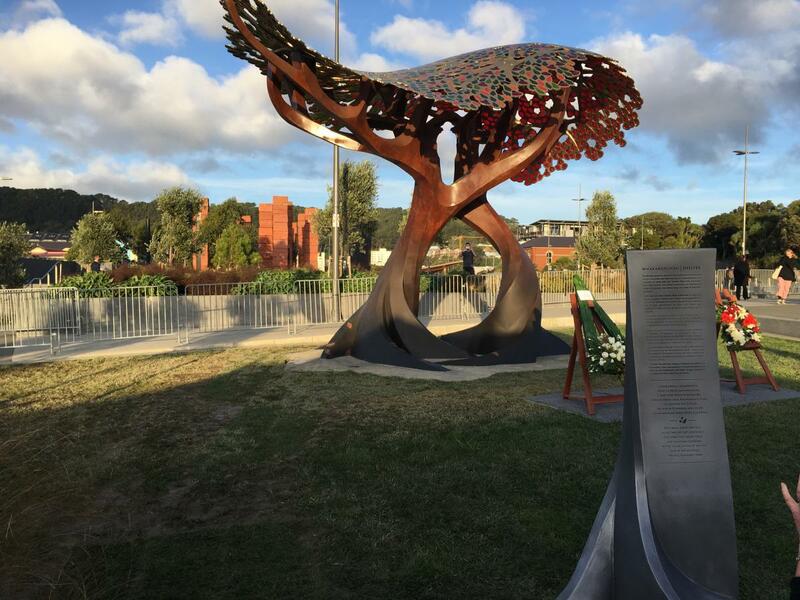 The memorial is made from mild steel, bronze and polycarbonates and weighs two and a half tonnes. It is one of the largest sculptures Weta Workshop has ever created and has had a team of 100 crew members bring the concept to a virtual reality and physical presence. Visiting Secretary of State for Foreign and Commonwealth Affairs, the Rt Hon Boris Johnson MP, will be at Pukeahu National War Memorial Park to unveil the memorial on Monday. Rt Hon Boris Johnson MP unveiling the Memorial plaque on 24th July 2017.